This awesome AEG is the perfect firearm for a soldier of any skill level and it would be a great addition to any soldiers Airsoft arsenal! It fires at 300 FPS and comes with a 250 round magazine giving you plenty of ammo so you don't have to worry about reloading! This awesome AEG features a collapsible stock to allow you to customize this gun to fit you perfectly for any battle! An integrated rail system will allow you to add on any of your favorite accessories like a bipod, fore grip or the included flashlight, scope and laser! The Double Eagle M805A2 has a plastic and metal construction design that gives it the ultimate look and feel, while also making it perfect for the wear and tear of battle! This AEG rifle comes ready to go right out of the box with a 7.2V rechargeable battery, a wall charger and the 250 round magazine! 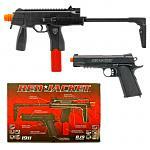 Designed for competition or practice this airsoft rifle is built to last through years of use! This is a great rifle for those looking for a reliable weapon that packs a serious punch. Don't forget to stock up on Airsoft Ammo! (L x W x H) 27.50" x 11.50" x 3.63"